This is a little confusing but I’ll try to keep it brief. 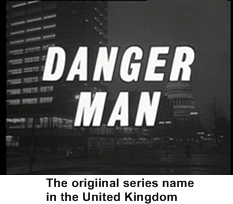 Danger Man was a 1/2 hour U.K. production which ran from 1960 through 1962. 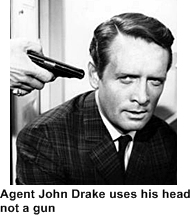 It starred Patrick McGoohan as agent John Drake who worked for a secret American intelligence agency. The show didn’t fare well and was canceled in Britain. Fast forward to 1964 a couple of James Bond movies have had great box office success so the producers decide to try their luck with the show in the States. 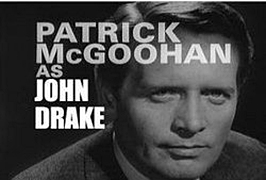 The show still stars McGoohan as John Drake but now that it’s an American series he has switched employeers and works for the fictitious British Government agency MI-9. 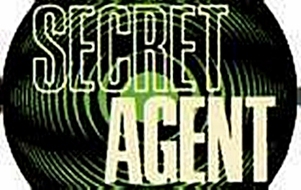 It’s lengthened to one hour and even the theme song is re-written to “Secret Agent Man”. The new show manages to catch the wave of spy-fi series that are popping up, including The Man from U.N.C.L.E. and the Avengers. Very much like the John Steed character from the Avengers John Drake didn’t carry a gun and always preferred charm and cunning over violence to undo the bad guys. It was Patrick McGoohan that insisted on keeping the show friendly enough to attract a family audience. Patrick McGoohan went on to produce and co-write a series called “The Prisoner”. It was based on a retired spy, called only Number Six, who is captured and held in an unescapable prison, called the Village, which resembled a resort hamlet. Although never actually confirmed the Number Six character closely resembles the cunning and principles of John Drake. A couple of characters from Secret Agent even make appearances in The Prisoner under the same names. Only seventeen episodes were produced but the show has one of the most devoted cult followings of any show ever made.